Faculty and graduate students at UC Irvine have been teaming up across disciplinary lines as part of the "People and Practices Research Initiative" funded by the Intel corporation. 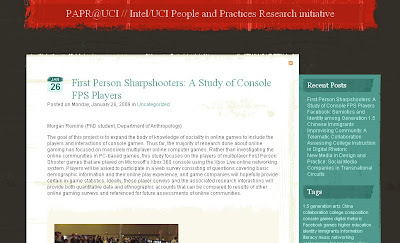 PAPR has not launched the PAPR@UCI Blog to publicize the range of projects that have been undertaken by UCI researchers who are looking at topics that include social practices around online console-based shooter games, the use of Facebook among Generation 1.5 Chinese immigrants, musical collaboration with teleconference tools, the information and technology ecologies of the homeless in Los Angeles, and the "craftivist" movement's use of Web 2.0. This posting explains my own assessment project funded by PAPR, which looks at how direct instruction in online composition in college coursework may impact Internet behavior longterm.